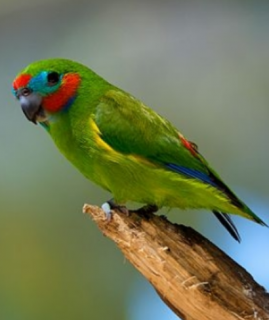 The Double-eyed Fig Parrot will respond to imitation of contact call by circling back, while in flight, to alight nearby. C.d. diophthalma: Male-red lores, forehead and forecrown, with orange/yellow band at hindcrown; blue above and in front of eye; red cheeks; red ear coverts, bordered underneath by lilac/blue stripe; inner wing coverts edged orange/red; pale yellow wide underwing bands. Bill pale grey with black near tip. Eye dark brown. Female-as in male but with buff/brown cheeks. C.d. coccineifrons: Both adults darker in general, especially the red on the face and inner wing coverts; broader more pronounced orange/yellow band on hindcrown. C.d. aruensis: Male-more green/blue above and in front of eye; lilac/blue band below cheek extending to chin; orange/yellow band on hindcrown diminished or absent; more yellow/green upperparts. Female-red on face absent, replaced by pale blue; orange/yellow band at hindcrown absent. C.d. virago: Male-paler red on crown and cheeks; blue around eye area absent; lilac/blue band below cheek reduced to spot. Female-red spot on centre of blue forehead; green face, lilac/blue bands below cheeks absent. C.d. inseparabilis: Both adults face all green with red spot in middle of forehead. C.d. marshalli: Male-as in aruensis, but darker blue above and in front of eye and without green tinge; smaller in size. Female-as in aruensis, but deep violet/blue on forehead and forecrown; smaller in size. C.d. macleayana: Male-red on centre of forehead, lower cheeks out to ear coverts; remainder of face blue, being darker on sides of forehead and paler with green tinge around eyes. Female-as in male but buff/brown on lower cheeks to ear coverts. C.d. coxeni: Both adults blue in centre of forehead; red feathers on lores and sides of forehead at base of bill; above and in front of eye bright yellow/green; red on lower cheeks to ear coverts, bordered beneath by lilac/blue band; larger in size. C.d. diophthalma: As in adult female. C.d. coccineifrons: As in adults. C.d. aruensis: As in adult female. C.d. virago: As in adult female. C.d. inseparabilis: As in adults. C.d. marshalli: As in adult female. C.d. macleayana: As in adult female. Voice thin and high-pitched double notes in flight, other calls chattering, twittering and high-pitched screech (alarm). Notes described as staccato and harsh. Walk-in enclosure, minimum length 2.1m (7 ft) or indoor suspended cage 1.8m (6 ft) long with easy-to-clean floor and walls. Soaked figs, two or more per bird daily; a drop of vitamin K additive once daily, other fruits forming at least 50 percent of diet; soaked raisins, berries (elder, montain ash, pyracantha), spray millet, small seed mixture, cooked beans, rearing food (hard-boiled egg, wholegrain bread and carrot all ground to crumbly consistency) Breeding diet: mealworms, small, well-cleaned maggots, insectivorous food. Withhold seeds first three weeks of chicks' lives. Provide lots of bird-safe, unsprayed branches (fir, pine, elder or willow) for them to chew; their beaks may become overgrown. Coxeni has suffered from the loss of lowland rainforest throughout its range. C.d. diophthalma: W Papuan islands, NW New Guinea. C.d. coccineifrons: SE New Guinea- Astrolabe Bay to Fly River. C.d. aruensis: S New Guinea (Fly River to Aru Islands). C.d. virago: Fergusson and Goodenough Islands. C.d. marshalli: North tip of Cape York Peninsula, Queenland, Australia. C.d. macleayana: NE Queenland from Cooktown to Townsville. C.d. coxeni: formerly SE Queensland and NE South Wales; range now limited. Found in variety of areas including rainforest, secondary growth forest, forest edge, riverine forest, occasionally dry forest and open Eucalypt woodland. Australia birds are also found in parks, gardens, scrub, mangrove and cultivated areas. Found up to 1600m (5248 ft). Fig seeds principal food item; also small whole fruits, nectar, insect larvae and fungus and lichen. Quiet feeders. Outside breeding season groups of up to 200 birds gather to roost. Alarm displays include wing flicking and agitated calls. May be in company of other fig parrots, rosellas and lorikeets. New Guinea: March; Australia August to November.